Cognitive scientist Marvin L. Minsky, who is also a co-founder of the MIT AI Laboratory, defines artificial intelligence as “the science of making machines do things that would require intelligence if done by men”. The term artificial intelligence is therefore used when machines perform human-like cognitive functions such as learning, understanding, reasoning and interacting. Artificial intelligence and machine learning are increasingly permeating our economies and societies. The OECD estimates that artificial intelligence already underpins over 50% of global financial transactions. This innovative technology has brought recent breakthroughs in both machine learning techniques, computational power, and systems design by adopting more human-like performance. 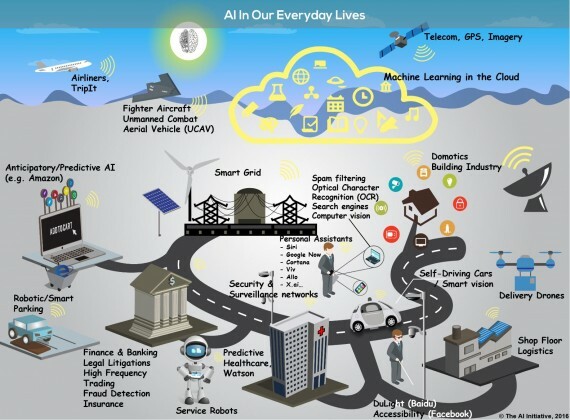 In addition to this, the prevalence of data, computation, and communication has also contributed to expanding the possibilities of artificial intelligence and its impact on everyday lives. For instance, technological companies such as Google or Facebook take advantage of data and artificial intelligence techniques to compile and process the information issued by internet users, identifying behaviour patterns. Artificial intelligence advances will then have important effects on individuals and on culture since they may create a new “language”, facilitate a more accessible knowledge or even alter the value of certain ways of thinking. Artificial intelligence advances are expected to have significant effects on individuals and on culture. They make knowledge more accessible, may create new forms of “language” and more importantly will change the value of certain tasks. Processes based mainly on memory are likely to be challenged by artificial intelligence while complex motricity, empathy and creativity may gain new value. Significant investments in artificial intelligence over recent years have opened up new opportunities in many different fields. A range of digital-world applications exists in areas such as social networking, advertising, customer service, finance, and healthcare. Numerous physical-world applications are also emerging in transportation (e.g. driverless cars and flying drones) and manufacturing. Since artificial intelligence sees data and patterns at scales that humans cannot, it creates opportunities for cost reductions and efficiency gains. The 2016 OECD Technology Foresight report on AI reveals that “a number of leading artificial intelligence experts warn that the likely impact of artificial intelligence in the years ahead is still underappreciated by policymakers and the public at large”. It is generally agreed that artificial intelligence technology, combined with big data and computing power, will transform entire sectors of the economy and lead to in-depth societal changes. Likewise, the AI Initiative of The Future Society (Harvard Kennedy School dedicated to the rise of AI) points out that “there are clear upsides and opportunities to increase quality of life and longevity for all as well as to shift the paradigm of growth and development towards sustainability”. Regions have a significant role to play to engage all relevant stakeholders and help shape the policy framework needed for a smooth digital transformation. Because they are at the same time close to citizens while being able to impact a significant territory, regions are well placed to harness the opportunities and address upcoming challenges. The ongoing race for the development of artificial intelligence, needs to be based on a human-centric design that respects the rules of societies, engagement of all stakeholders is therefore essential. AER members will benefit from a extensive exchange of expertise through different activities which will be organised on this topic within the network. The objective is to highlight the experience and stories from the regions, and identify fields for action at regional level across Europe. To this end the Jean-Luc Vanraes, President of the AER Committee on Regional Development and Economy is inviting AER members to contribute to the organisation of an event on artificial intelligence to be held in Brussels, on November 30th 2017. This event, “Artificial Intelligence: are regions up to the challenge” will be organised on the same format as the event “E-health let’s find a common language” which took place in December 2016 with the contribution of very diverse stakeholders. For more information check out the Committee 1 for Economy and Regional Development work programme!